Prevention is a key concept in OSH. In fact, the prevention of accidents at work and occupational diseases must be the main goal of any management OSH system, much more than attempts to solve problems once they occur. This principle is gaining higher importance as organizations change very quickly (due to globalization, reduced workload, temporary work, part-time work, sub-contracting, aging of the workforce, etc. ), which calls for a dynamic OSH approach. Every year the conference has open doors for the Balcan. 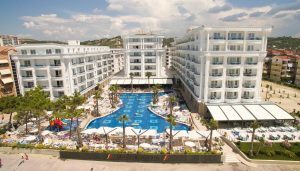 This time, from 30-th May till 1-st of June 2019, Albania will welcome the global preventive community in Durrës, Grand Blue Fafa Resort. Join us at this international gathering in the field of occupational safety and health. The International Conference for Regional Cooperation of Civil Society Organizations is a key Balcan event for the exchange of information and opinions from OSH, representatives of companies and employees, decision-makers from the government and public authorities, social partners and everyone who is active in the field of occupational safety and health at work. International Conference for Regional Collaboration Balkan OSH shared a link. International Conference for Regional Collaboration Balkan OSH updated their cover photo.